Optimizing the treatment of mitral stenosis is not a simple thing. The key to treating mitral stenosis is making a good decision about when (or whether) to perform surgery. In addition, it is critical to take appropriate steps to prevent thrombosis (blood clots) from forming in the cardiac chambers. With mitral stenosis, the mitral valve (the valve that lies in between the heart's two left chambers) becomes thickened and immobile, failing to open completely and impeding blood flow. Since mitral stenosis is fundamentally a mechanical problem, the ultimate solution must be a surgical one—that is, a surgical intervention to relieve the obstruction. So if you have mitral stenosis, the most critical question is deciding whether to perform surgery and when to perform it. The timing of mitral valve surgery is very important. Mitral stenosis usually gets worse very slowly, and people with this valve disorder can remain entirely without symptoms for many years. 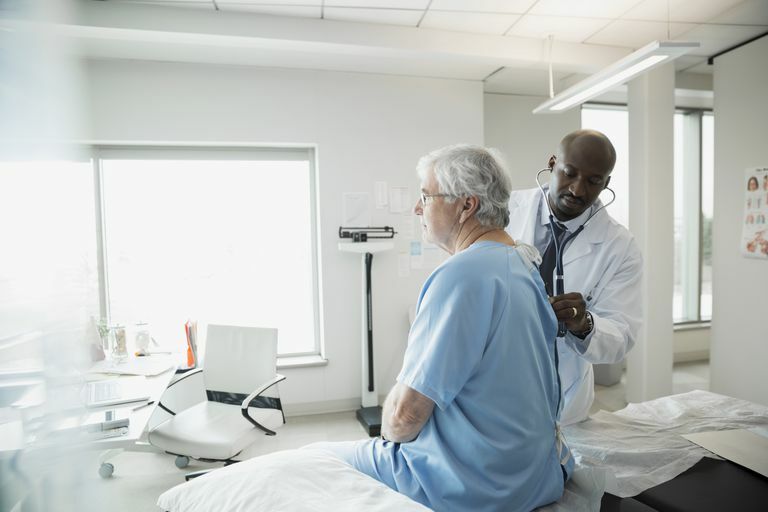 While you may be tempted to perform corrective surgery early on to avoid developing significant cardiac symptoms, doing the surgery too early can produce unnecessary risk. On the other hand, waiting too long to perform surgery can lead to irreversible heart damage, so that mitral valve surgery will no longer be effective. This can be a fatal mistake—so timing is everything. Deciding on the appropriate time to perform mitral valve surgery largely depends on your symptoms, as well as objective measurements of how well your mitral valve opens and of the pressure within your pulmonary artery. These measurements can be done with an echocardiogram. With these considerations, let's look at some general "rules" for deciding when it's time for surgery. If you have no symptoms at all and your mitral stenosis is considered mild, the main decision you and your doctor will make is how often you should have repeat evaluations. Depending on your assessment, echocardiograms performed every year or 2 to 3 years may be necessary. If you experience shortness of breath or fatigue in between checks, however, let your doctor know right away. If you have mild mitral stenosis and mild symptoms, your doctor may ask you to have an exercise echocardiogram—that is, a stress test during which an echocardiogram is performed. This test allows the doctor to estimate your pulmonary artery pressure during exercise. If you develop elevated pulmonary artery pressure during exercise, your doctor may refer you for surgery. However, in general, patients with mild MS are referred for mitral valve repair only if they are candidates for percutaneous mitral balloon valvotomy (PMBV), a relatively non-invasive mitral valve repair procedure. If you have moderate to severe mitral stenosis and also have symptoms, and your pulmonary artery pressure is elevated either at rest or during exercise, you should have surgery. In this case you will probably be referred for PMBV if that procedure is feasible. If it is not feasible, you will be referred for another mitral stenosis surgery—an open procedure to either repair or replace your mitral valve. If you have severe mitral stenosis and very significant symptoms, the issue is no longer whether the problem is severe enough to perform surgery, but whether it has progressed beyond the point where surgery would be of any help. Making this decision can be relatively difficult, and it often involves a full cardiac catherization and close consultation and discussion between you, your cardiologist and the cardiac surgeon. If it becomes time for surgery, you and your doctors will need to decide which of the types of surgery for mitral stenosis would be best for you. Can Drugs Help Mitral Stenosis? Definitive therapy of mitral stenosis requires physically relieving the obstruction, but medical therapy can offer some advantages. Diuretics (water pills), usually the more powerful diuretics such as Lasix or Bumex, can help with shortness of breath or with fluid retention. Using drugs to prevent rheumatic fever is important, especially in younger patients, if the mitral stenosis is due to rheumatic heart disease. In general, using drugs that help prevent infectious endocarditis is no longer recommended for people with MS. Since atrial fibrillation tends to cause worse symptoms in patients with mitral stenosis than in patients without it, aggressive treatment to control this arrhythmia should be used. People with mitral stenosis have an increased risk of thromboembolism (blood clots within blood vessels or the heart that break off and cause tissue damage such as stroke). In mitral stenosis, the thrombus (clot) tends to form in the left atrium. The risk of thromboembolism is greatly increased if atrial fibrillation is present. Mitral stenosis is a cardiac condition whose optimal management requires close cooperation between you and your doctor. However, with good medical and surgical care, people with mitral stenosis generally can expect a quite good outcome.